Imagine spending countless hours creating a unique painting. When your masterpiece is complete, the facility where your masterpiece is stored makes 2 identical copies of the painting before sending it off to an art gallery. Unfortunately, the art gallery actually receives all 3 versions of your masterpiece. Not knowing which the original is, the gallery chooses a version that actually turns out to be a copy to display. When you arrive at the gallery for the opening night, your mouth drops open as you spot it. A duplicate copy of your masterpiece has been displayed instead of the original. Duplicate content on a website, like multiple identical versions of a painting in an art gallery, can cause the wrong content to be spotlighted in the search engine results. Out of the box, WordPress does have issues with duplicate content. This tutorial will cover what duplicate content is and how to setup WordPress by Yoast to avoid duplicate content on your own WordPress website or blog. Why Should You Avoid Duplicate Content? Google does work hard to index and display pages with distinct information by using special filters. If a website has two versions of the same content, Google will select one to display. If, however, Google perceives that duplicate content is being shown “with the intent to manipulate rankings and/or to deceive users,” the search engine giant may make indexing and ranking adjustments in rare cases. Make sure you’re familiar with how content is displayed on your web site. Blogs, forums, and related systems often show the same content in multiple formats. For example, a blog entry may appear on the home page of a blog, in an archive page, and in a page of other entries with the same label. As with the artist’s original painting, you will want your original content to be indexed and displayed by Google instead of an inadvertent duplicate. 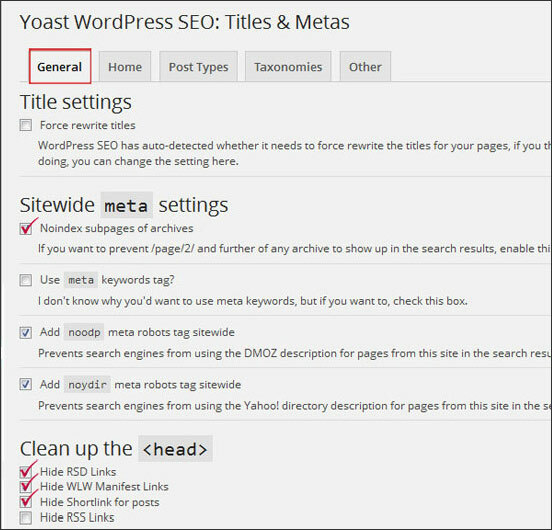 The following includes a visual tutorial to help you set up WordPress SEO by Yoast to avoid duplicate content within your own website. General Tab – under the General tab, locate “Sitewide meta settings.” Check “Noindex subpages of archives.” This will ensure that archives with duplicate content will not show up in search results. Taxonomies Tab – under the Taxonomies tab, you will see options for Categories, Tags and Format. The Format “noindex, follow” will be checked. This will tell the search engines not to index a page and to follow it. You will need to make a decision on categories and tags. If you have a smaller site, you might like to choose either the category or the tag structure. When you have chosen one, check the “noindex, follow” on the other. 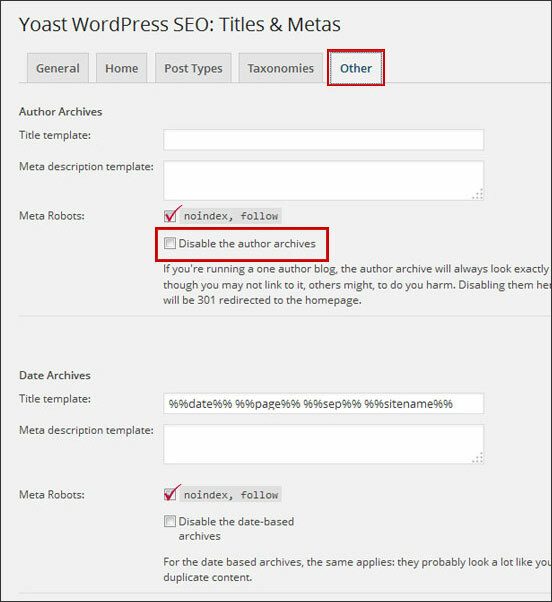 Author Archives – If you are the only author on your WordPress blog, you will want to disable the Author Archives. If you do have multiple authors and want to use the Author Archives, be sure to check the “no index, follow” next to the Meta Robots box. Date Archives – Date based archives are another source of WordPress duplicate content. To ensure that the date archives do not cause duplicate content, check the “no index, follow” next to the Meta Robots box. There are a few quick ways to determine if your WordPress website or blog has duplicate content indexed by Google. These methods are not conclusive and may not show every duplicate content issue on your website. However, they will give you a good idea if your site currently has an issue. Google: Go to Google.com and search for your site’s indexed pages by using this format: site:www.yoursite.com. Examine the indexed links of your site and look at the URLs. If any of the links in the search results have any of the following included, it is time to get to work. Will Duplicate Content Hurt Your Search Rankings? For the most part, duplicate content operates as a filter. This means it is not a penalty. What this means is that when a search engine sees multiple copies of the same piece of content they will choose only one of them to show in the search results. In the same article, Eric does point out that he has “encountered an actual penalty situation that resulted from duplicate content.” That site had a total of 70% of the pages that were duplicates. The bottom line is that you will want to avoid duplicate content on your WordPress driven website or blog to avoid potential problems and to provide your visitors with a great user experience. By using the WordPress SEO by Yoast plugin and properly setting it up, you will be ensuring that your content masterpiece will be spotlighted as you intend it to in the search engine results. 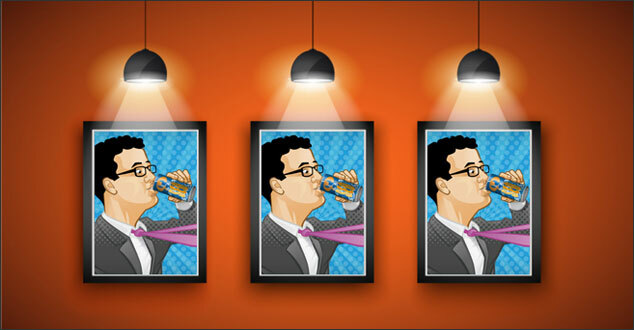 Were you aware that out of the box, WordPress has so many duplicate content issues? You know that I’m working hard on making Yoast the perfect plugin on my site. I sincerely appreciate all of the information you’re sending about Yoast. I’m going to have to diligently look this one over (after Mother’s Day) to see what changes I can make. Thank you, thank you, thank you! Yes, I do know that you are working hard on making WordPress SEO by Yoast the perfect plugin for your website. It is my pleasure to help in any way that I can. Please let me know if you have any questions when you have the chance to take a closer look. Thank you! Love the analogy you have given here with an artist painting an original. Why duplicate it? Your information shared is so important because my blog is too precious to me to have duplicate content. I even create my own images because I want everything to be original, even if sometimes it may look like a 5 year old has done it he he he. We do have to be careful out there. I like to write in my own voice and use original content. Maybe it is because I’m a blabber mouth by nature and it reflects in my blog. But even so, it is best practice to check and see before we push that publish button. I love using Yoast! Once that green light goes on..I’m good to go. I’m not much of a techie, so this works great for me. I’m happy to hear that you like the analogy of the original painting and the copies. Our articles are too precious to have duplicates. That is great that you create your own images. They always look great and add a special touch. Original images, like content is golden. 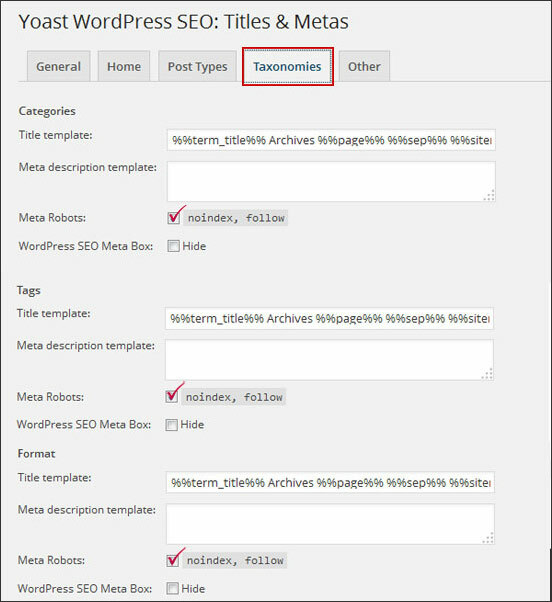 Yoast is a great tool for fixing WordPress’ duplicate content issues. So many are not aware of the multiple issues that WordPress has with duplicate content. 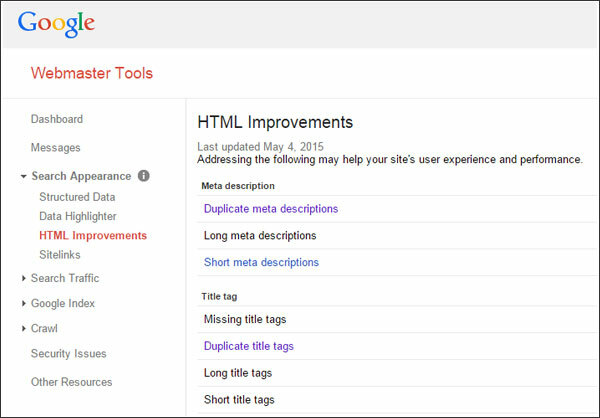 A quick look at Google Webmaster Tools HTML improvements can be an eye opener. Thank you for stopping by and for your comment! I hope you have a wonderful week! I went and checked out all your suggestions. I believe my blog site is ok. Thanks for the heads up. That is great news! I’m glad to hear that your blog site is OK. It is my absolute pleasure and thank you for stopping by. Oh, this indeed a timely alert.Everyone on the net is trying there hand on this wonderful option, though it’s a good idea to try everything, but many fails. I fully agree with you in these aspects you shared here.I am sure these are very valuable points to make note of before attempting for one such post.